Another year, another birthday! Yeah! For my little brother, Jake, whom I love to bits. The photograph is in terrible shape, and so is this copy. But here he is, back from hospital with Mom, about 10 days old. This post is 2 days late, as I saved it for Wordless Wednesday. I'm sure he won't mind! Following the challenge from Amy Johnson Crow to write a post weekly, 52 Ancestors in 52 Weeks, here is my 35th installment, Mary Elizabeth GRAVES. This is my ex-husband's 6th great-grandmother. I have GRAVES in my own mother's lines, but I have yet to see how - or if - they link up. Neither seem to be listed on the GRAVES Family Association, which is a very active helpful surname association. Known as Elizabeth, Mary Elizabeth's parents were Thomas GRAVES & Sarah TURNER. Both seem to have been born in the late 1600s, perhaps around 1680, although it is not known where they were born, to date. I have much research to do for this family group. Elizabeth was born in 1706, in Craven county, North Carolina. However, Craven county was formed out of the now-extinct Bath county, in 1712 - so this date of 1706 for the birthplace is not quite accurate. Click on the link for more detailed information and maps of the area at the time of her birth. Elizabeth married Simon BRIGHT in approx 1725. Simon was apparently born in about 1706 in Hyde Precinct which had many boundary changes, as well. Click on the link for a short history of these changes. There is a tall detailed memorial obelisk at Saint John Cemetery, Grifton, Pitt, North Carolina. This photo was taken by a BillionGraves volunteer, and is transcribed. On it you can read a list of a number of direct ancestors in the BRIGHT family, with their relationship to a much younger Bright descendant, who likely put up this obelisk. Clearly, this is my next step in using clues on the obelisk for more research of this family. Simon BRIGHT appears to have died approximately 1770 in North Carolina. However, his wife was alive at the time at his death; therefore Elizabeth must have died after 1772. I have not yet found a probate for Mary Elizabeth GRAVES Bright. Whoops! I did a quick search on FamilySearch.org for Thomas Graves, Mary Elizabeth's father, and found a detailed Probate (but no will shown) of (Major) Thomas Graves, dated 1767 with names as follows: No.1 Mrs. Sarah Graves, No.2 Mary Bright, No.3 Ann Graves, No.4 Thomas Graves (jr? ), No.5 Sarah jr. It appears to be the probate of the senior Thomas Graves. Of course, since Thomas and Sarah are common names, it is within probability of being a younger Thomas Graves, a brother or cousin to Mary who married another Sarah? A "John Turner" was the Administer and Co-Executor for this Will, which is another link in the TURNER-GRAVES-BRIGHT families, Thomas Graves (jr?) was the other Executor. He filed the final inventory and invoice in June 1772. Thomas Graves Sr. seems to have been quite wealthy from the many pages of goods, and of the amounts the estate received from sales of cattle and other items [including 3 Negroes - which I was so sad to see]. I've now downloaded all 27 pages, and will dig through them later on. This find is, of course, exactly why the 52 Ancestors in 52 Weeks Challenge is such a helpful challenge. Not only may others find details on my ancestors, but also, I am twigged to do more research and therefore find more as well! If you have further information on Mary "Elizabeth" GRAVES and her family, I would be thrilled to add to our family tree. As well, if you see errors in this listing, don't hesitate to let me know - I am always happy to correct my details! You may contact me via calewis at telus dot com or in the Comments below. Thanks for visiting. Following the challenge from Amy Johnson Crow to write a post weekly, 52 Ancestors in 52 Weeks, here is my 34th installment, Edward McCABE. My 3rd great-grandfather on my mother's lines, Edward emigrated from County Monaghan in Ireland in the late 1700s, to Pennsylvania. Edward's birthdate is confusing - two stones show different ages for the same death date, but it seems he was born in roughly 1760-1772. It is not known when Edward McCABE arrived in Pennsylvania, although it had to have been before his marriage date, of course. It is possible that he came over with other family members. Almost all the information I have on Edward is from the engraving on the KUHN very large memorial obelisk in the Conewago Chapel Basilica Cemetery, in Conewago Township, Adams, PA. Look at both the obelisk and the small original stone, on the FindAGrave site. There is an Edward McCabe listed on Penn's Township, York County, Pennsylvania (near Hanover), on the Tax List of 1778-1780. However, there is no proof this is the same Edward McCabe, as there are no other details listed. I have yet to find him listed on the 1790 Census, likely in Pennsylvania. On 17 Jul 1797, possibly in Morgantown, Pennsylvania, Edward married Rebecca HUDSON, the middle of 7 children of John HUDSON and Mary MORGAN. 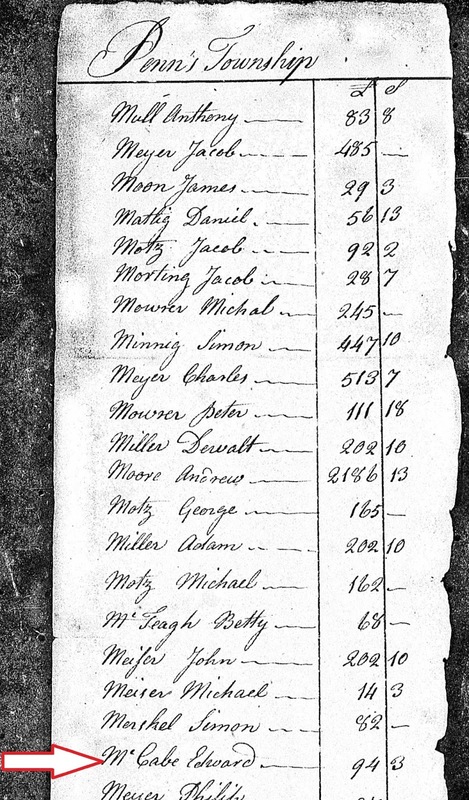 The family may be found on the 1800 Census of Uwchlan, Chester, PA. Next on the list is a Benjamin Morgan, who may possibly be Rebecca's uncle or other relative. This record is likely a transcription of the original tax list, as it is alphabetized (roughly). 1. (Sister) Maria Cecelia, b.1798; went to school with the Sisters of Emmittsburg, Maryland, where she entered the convent. In 1806, Edward McCabe is listed as the co-Executor of a will in Westtown, Chester, PA. This was for a Margaret McClosky; it is unknown how she may be related to Edward McCabe. Perhaps a friend of the family? I have no McClosky surnames in the family tree. Edward died 3 Apr 1814, and is apparently buried in the Conewago Chapel Basilica Cemetery in Conewago, Adams, PA. There is a very large KUHN obelisk, 4 sided, with many Kuhn ancestors and their wives/husbands listed, as is Edward McCABE and Rebecca HUDSON. Rebecca married for a second time to a widower with 6 children, John Bair; marriage date not found as yet. She did not seem to have any more children with John. She is buried with John in Mt. Olivet Cemetery, in Hanover, York, PA. There was very little detail on her on FindAGrave, so I added a bit of information for future searchers. If you have any further information about Edward McCabe and his family, I would be very happy to hear about it. And any corrections and mistakes will gladly be changed if you would pass on your information and sources. You can contact me via calewis at telus dot net or via the Comments section below. Thanks for visiting. Following the challenge of writing 52 Ancestors in 52 Weeks, issued by Amy Johnson Crow , here is my 33rd installment, Joshua BAILEY, sometimes written as Baily. The BAILEY ancestors are in my ex-husband's lines; Joshua would be his 4th great-grandfather through his mother's side. Joshua BAILEY, b. 17 Jun 1735, Scituate, Massachusetts, was the 2nd child of 5 known children of Deacon Joseph BAILEY and his wife, Elizabeth WHITE, all children born in Scituate, a town first settled in 1633. Check out this link for the free version of the History of Scituate Massachusetts, from its first settlement to 1831, by Samuel Deane. A fascinating account including details of life, land planning, parishes, rivers, roads, mills, and town records and mores! How does one pronounce "Scituate"-? Answer: SIT-chew-it. On 2 Oct 1756, Joshua married Abigail CLAP(P), b. 21 Aug 1736 in Scituate. Although I have yet to confirm her parents' details, the CLAP family were early settlers in Scituate, the original settler being Mr. , according to the previously mentioned History. More research is needed here. It may well be that her father is Benjamin CLAP(P), wife Grace____, but this is not yet proven. As you can see by the birth years above, it is likely there are several more children not yet found. Jabez HEALY, Grace's husband, was discussed several weeks ago. And I have yet to go looking for more children, more details, additional records. I believe that this is the Joseph Bailey listed as a Revolutionary War Patriot, but this still needs more research to confirm. There were other Bailey men from Massachusetts, of course. I also have not confirmed a cemetery burial for Joshua, or his wife, Abigail. If you have questions about this information, or have additional details or corrections, do please contact me via calewis at telus dot net, or in the Comments section below. Thanks for visiting. Following the challenge of writing 52 Ancestors in 52 Weeks, issued by Amy Johnson Crow , here is my 32nd installment, William STEVENS, who came to the New England colonies with his father and several siblings. The surname is sometimes spelled Stephens. William STEVENS, b.abt 1630 in Kenilworth, Warwickshire, England, was the 3rd child of John & Mary Ann STEVENS (John, 1600-1671). The other children were Mary, b. 1624, Thomas b. 1628, and John, b. 1632. I have no information as yet on his siblings. We know that on 3 Mar 1652/3 in Guilford, Connecticut, William married Mary MEIGS/Meggs, so we know the family had emigrated before that time. Mary was the daughter of John MEIGS & Tomisina FRYE, and was the granddaughter of the original Meigs immigrant, Vincent. Both immigrant families appear to have arrived in the colony before 1640. Much of my information on William & Mary came from the following book, Record of the Descendents of Vincent Meigs: who came from Dorsetshire to America about 1635 (Westfield, N.J., USA: self-published, 1935 (based on 1st pub. by H.B.Meigs, 1901)). There are some dates and details which contradict others from various documents, but it is a worthwhile place from which to start further research. William & Mary died within two months of each other: William, aged 73, died 26 Feb 1702/3, and Mary, aged 70, died 30 Apr 1703. Naturally I need to do more research on William and his family, but this is a start. If you have any questions or have further information, do contact me via calewis at telus dot net, or leave details in the Comments section below. I always appreciate corrections, as well.